Digital Impact completes a retail showroom design and installation for the HiFi House, high-end home theater and high-performance A/V stereo equipment. http://hifihouse.com/. 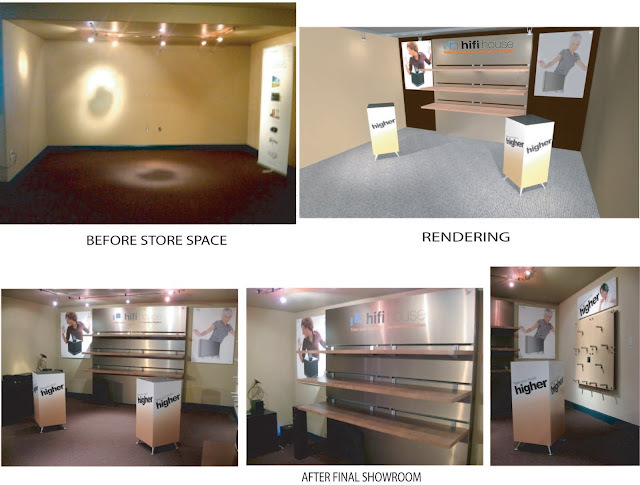 Digital Impact and Ocean Design Group worked side by side with creative marketing group, Thomas J. Paul, Inc., to outfit the HiFi House with an attracting and functional showroom that will enhance their branding. Thomas J. Paul, Inc did a wonderful job with their creative and branding services. Material Printed: Digital Impacts Durst Rho 900 printed, 6mm PVC Board, 6mm Lexan, and Wilsonart Metal Laminate over MDF Core. Construction and Installation: Ocean Design Group's design of the permanent displays allowed the assembly and installation of the graphic pedestals and shelf system, by Digital Impact, to be easily controlled in-house.